In a recent study, GOBankingRates looked at 100 of the largest U.S. cities to determine where it’s possible for retirees to rent a one-bedroom home for less than $1,000 per month. Retirees might want to consider heading to Texas. Of the 20 best cities for retirees found in the study, four are located in the Lone Star State. Those looking to retire and live comfortably in the Midwest also have good options. Three Midwest cities have median one-bedroom rents of $500 or less a month. Two years ago, I moved with my family to Southern California to live closer to my wife’s family. While I love the sunshine, year-round warm weather and quick drives to the beach, there is one thing that Southern California certainly does not offer: a cheap place to live. 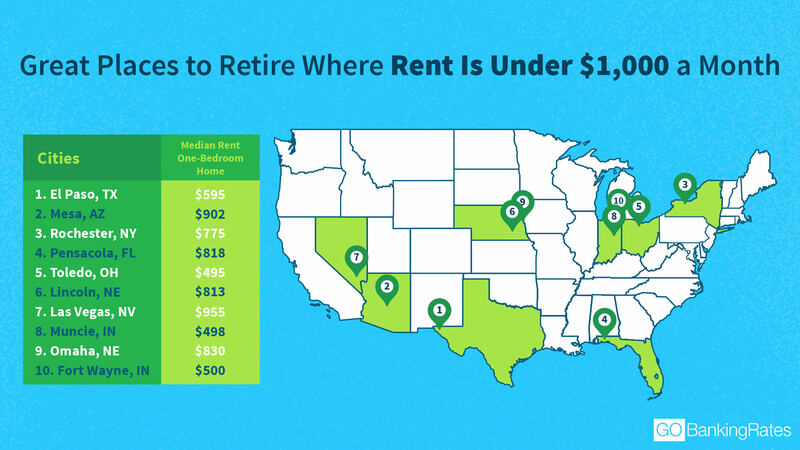 In fact, my region of the country is one of the most expensive in the United States, but there are plenty of places where you might be able to get by on just $1,000 per month in rent during retirement, according to a new GOBankingRates study. Keep reading to learn about the top destinations where you can make this happen. If you want to save big, consider El Paso, Texas. Right on the Mexico border, El Paso offers a nice quality of life and an average monthly rent of just $595 per month for a one-bedroom apartment. Killeen is even cheaper at $450 per month. If you want to live in the Midwest instead, you can still find some great deals. In Toledo, Ohio, you will pay just $495 for a typical one-bedroom apartment. In nearby Indiana, you can grab a similar apartment for $498 per month in Muncie and $500 per month in Fort Wayne. Affordable cities on the coasts include Fresno, Calif., at $695 per month and Fayetteville, N.C., at $660 per month. In my Southern California hometown, Ventura, the average home price is $594,500, according to Zillow. Housing costs in my city are a lot higher than the national average of $217,300. But even if I can pay off my home completely by the time I retire, which is the plan, property taxes alone are $833 per month. That gives me less than $200 of wiggle room in my budget for food, clothing, entertainment, transportation, medical care and everything else, assuming my budget isn’t limited to just rent. When putting your retirement plan together, consider all angles of your future financial needs. According to Fidelity, medical expenses in retirement add up to $280,000 for the typical retiree. And that is just one part of the budget. Think long and hard about your housing and other living costs. If I moved a few hours east, I could save a fortune on living expenses, but I would also give up the wonderful lifestyle I love in my little beach city. Sometimes retiring on more is worth it — just make sure it is intentional. Don’t spend more than you have to because you went into retirement without a plan. Click through to read about the best and worst cities to retire rich. GOBankingRates > Retirement > Planning > Is It Possible to Retire on $1,000 a Month?